All of the NFC East rivalries are bitter, but Philadelphia vs Dallas is probably the worst. These games bring out the best or worst in the Eagles. No game last year was as fun for Eagles fans as the 33-10 demolition of Dallas in front of 20 million viewers on Thanksgiving Day, not even the 27-0 shutout of the disrespectful but less fearsome New York Giants. In 2013, the perfect capper to the regular season was the Week 17 game that sent the Eagles to the playoffs — by knocking Dallas out. But when it goes bad, it goes really badly. The early season losses to the Cowboys in 2013 (17-3 — Chip Kelly‘s lowest scoring game as coach at any level) and in Week 2 of this year (20-10, his fourth lowest) were epic collapses. As you’ll recall, the Eagles managed a total of seven yards rushing in the latter, led by Sam Bradford‘s nine yards. That’s right, the three running backs on the team combined for minus-two yards running. When Sunday’s prime time night game rolled around, it seemed likely to be a horrible game. The Eagles were 3-4, and the ‘Boys were worse at 2-5, having lost five straight after quarterback Tony Romo broke his collarbone in that Game 2 victory. Injuring your opponent is another big part of this bitter tradition. Nick Foles was knocked out of the 2013 loss with a head injury. DeMarco Murray broke his finger against the Eagles last year, though he played through it. And rookie star Jordan Hicks knocked Romo out for eight games in the loss this year, when his strip sack broke the QB’s collarbone. Forget the expectations. The game was a well-executed thriller with a happy ending, as the Eagles scored a TD on the first possession of overtime to win, 33-27. 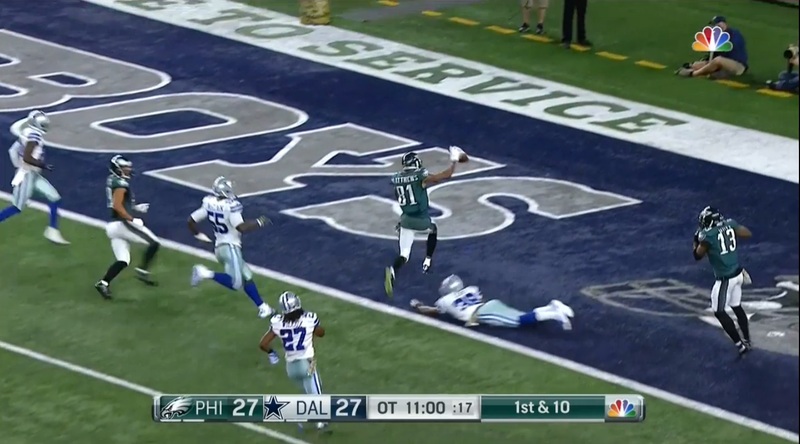 Jordan Hicks’ interception en route to a pick six. The tradition of injuries continued too, though. Dallas took their pound of flesh as that same Jordan Hicks, a modern day Kiko Alonso-type playmaker at inside linebacker, tore his pectoral tendon and is out for the rest of his outstanding rookie season. Dallas had several injuries in the game, including LB Sean Lee’s second concussion of the year, but none was as damaging as the loss of Hicks (who had added a pick-six to his glittering stats before he went down). It’s easy to dismiss this loss, since Romo was injured and backup QB Brandon Weeden had been benched for ineffectiveness, but Dallas does not die. They are Undead, like a zombie that you can kill over and over without stopping it from pursuing you. Dez Bryant and Randy Gregory were back from injuries that also contributed to the losing streak, and defensive end Greg Hardy had returned from suspension despite his disputed conviction for beating up his girlfriend. The Cowboys’ losses this year have been close, and they played the Eagles very tough. 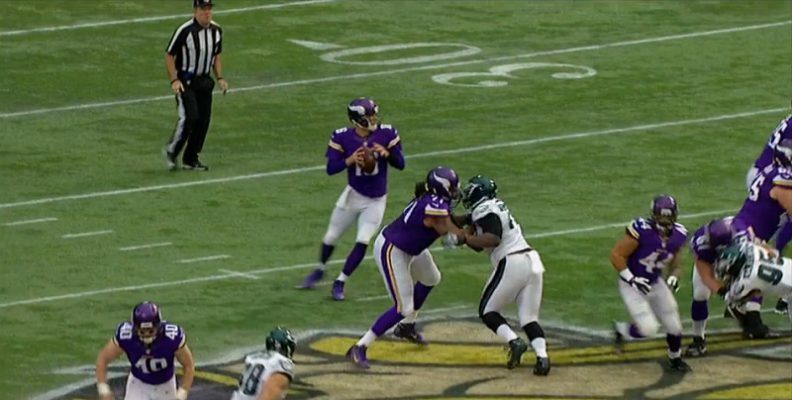 Matt Cassel doing damage in the 2013 Vikings-Eagles game. Third-string quarterback Matt Cassel destroyed Philadelphia in 2013, giving them the only loss of that season’s second half while playing for Minnesota, and he threw very well Sunday too (25-38 for 299 yards and three touchdowns, despite the pick six). But the Eagles actually played good defense, aside from one matchup problem (Malcolm Jenkins covering Cole Beasley in the slot) that Cassel exploited ruthlessly for three third-down conversions and a touchdown on just one drive. The Birds played even better on offense, with only two notable drops by receivers (very few for this squad). Bradford threw decisively and accurately, including a perfect 41-yard catch-and-run to Jordan Matthews in overtime for the win. DeMarco Murray gains 20 yards in OT. And the running attack was even better, more than 27 times better than the first Dallas-Philadelphia game to be precise (at 172 yards and two TDs). The much-anticipated three-headed monster of Murray, Ryan Mathews and Darren Sproles has finally emerged, with no less than 158 yards between them in each of the last four games. As Chip Kelly had hoped, they combine with the tempo offense to punish defenses and leave them literally gasping by the end of the game. The offensive line has improved dramatically, even as injuries continue. Pro Bowl left tackle Jason Peters was out, so Lane Johnson moved over from right tackle and deep bench lineman Dennis Kelly came in and shined, especially in the run game. The Birds also mixed up some play calls and blocking schemes, using unbalanced lines and what center Jason Kelce called the “mid-zone” play, an outside zone run that is more off-tackle than around the edge. Put it all together and this still-rough team has a good chance of making a strong second half run, going 5-3 or even 6-2. Either should be plenty enough to win this sucky division, but if the improvement continues, Philadelphia might actually win a playoff game or two. Even if not, the team is getting much more fun to watch. Most importantly, they destroyed any hope Dallas might have had that the return of Bryant and Romo might spark a comeback to win the division. They also shut down Hardy, who got a sack and a couple of pressures (and also gave the Eagles 20 yards in penalties), but wasn’t a significant factor in the game. Dallas is always tough, but the Eagles kept fighting the undying zombie until they finally cut its head off, both for the game and the season. And that was as happy an ending as any movie ever has.